U 849 made only one patrol when assigned for a monsoon wolfpack. No ships sunk were credited. There are no detailed information on the sinking. 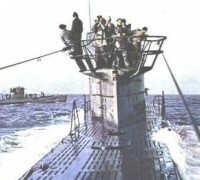 U 849 was reported to be sunk by one VB 107 Liberator in mid South Atlantic. The same had no survivors. At 0645 I departed from Ascension Island on an A/S sweep as described in attached report. The squadron for the past two days had been operating on a new frequency and I experienced difficulty in contacting plane number 8 which was participating in sweep. The last communication I had with him prior to the attack was at 1000 and that was weak. While flying at 5200 feet, my co-pilot, Ens. 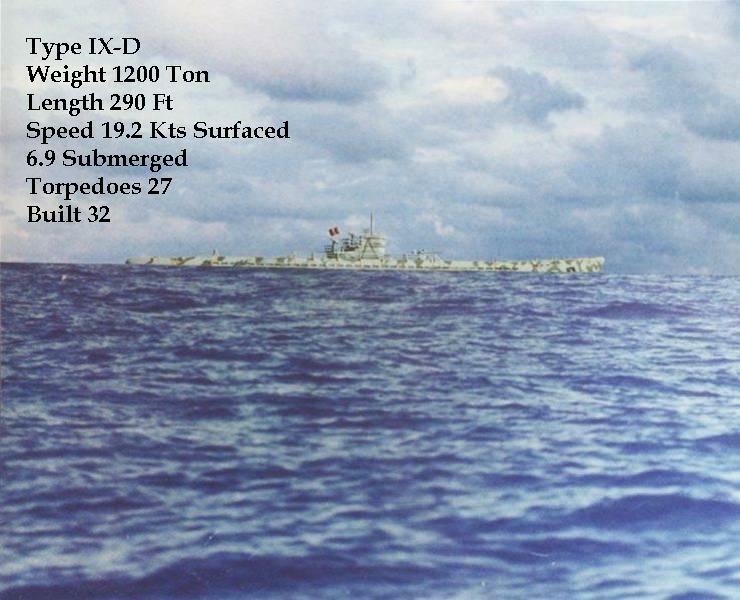 EIDE sighted a target about 030° off starboard bow which was readily identified as an enemy submarine by myself and Ens. VALENTINE, (nav.). The range was about 10 miles, the U/B's course, 170°t. - Our course 095°t. Sounded warning horn and gave instructions to navigator to check intervalometer and U/B position. The photographer was ordered to man his station. Original altitude was maintained while course was changed to 150°t. At approximately 5 miles range ordered "SSS" signal sent. Began rapid decent through clouds and broke through at 2000 feet, 1 mile astern of target. At 2500 rpm. and 40" m/p I attacked U/B, releasing bombs in steep glide with an intervalometer spacing of 50 feet at 200 mph. My target angle was about 160° and altitude 25 feet. Six bombs were released which were observed to envelope submarine in one large detonation, two bombs falling close to starboard quarter, three close to port beam - while the 6th possibly struck U/B's deck. After the drop my tail turret strafed the conning tower and deck on which a few personnel were seen. The crown turret and nose guns did not fire due to the suddenness of the attack. Chow was being served at the time of sighting which led to some confusion aboard. I thought it advisable not to delay the attack until these guns were ready as the element of surprise might be lost. As it was the U/B was taken completely off guard and not a shot was fired until after we passed over the conning tower. As the plane cleared the conning tower, I felt a loss of control in rudders while nose dropped badly. Lost further altitude and nearly struck water, but pulled heavily back on the yoke and plane climbed slowly to 800 feet where I observed "AA" fire short and below the plane. U/B gave out large oil slick and had no way on it. It had been blown 45° to port. Ordered navigator to prepare the three remaining bombs for drop and co-pilot to contact B-8 and advise of attack and position and to home on me on 414 kcs. Climbed up to 1500 feet and out of range of "AA" fire. B-8 could not be contacted but base picked up message and relayed it. Started sending MO's but observing that U/B was severely crippled and not knowing the extent of damage to my plane, I did not think it advisable to deliver a second attack until B-8 arrived. However, kept plane within striking distance and ordered all hands to observe closely any attempt of U/B to submerge. 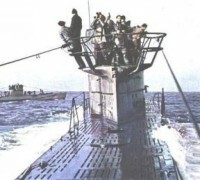 While circling U/B I was informed by after station and bow that crew was abandoning sub. Closed in on target rapidly to take pictures but while 1 mile from U/B, it exploded some 200 feet in air. Thereafter dropped to about 500 feet and took pictures of survivors. Departed area at 1130 and finally contacted B-8 at 1125 and advised him of attack and sinking. During the entire action, my crew manned their station with highest efficiency. Ens. EIDE, my co-pilot proved invaluable and Ens. VALENTINE and ROBERG, ARM1c, were of the utmost assistance.